You want to stay focused and alert while working—who doesn’t? The trouble is, you’re hungry. Like, really hungry. You’ve got to plan your office snacking carefully to avoid the food coma brought on by a heavier meal, or the inevitable sugar crash that Snickers bar will surely bring on later in the day. You need something that will be filling, satisfying, but not leave you in a slump. 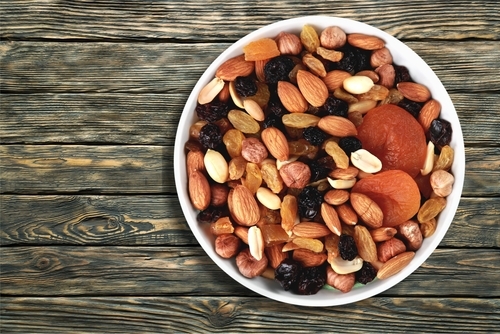 Here are seven healthy work snacks to reach for during work hours. Now, while many of these are often termed “superfoods,” the concept of superfoods is controversial (we’ll get to that later); nevertheless, the following foods have certainly been shown to have numerous health benefits. Eat up, and you might find that mid-afternoon slump a thing of the past. Let’s start at the top—breakfast. If you’ve rushed out the door, it might be tempting to skip breakfast entirely, but this will undoubtedly cause hunger later on, as well as potentially lessen your performance at work. 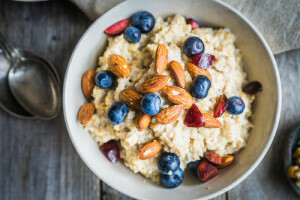 Whole grains like oatmeal are filling, full of fiber, and will keep you full longer—without the sugar crash that fast bakery breakfasts like doughnuts or coffee cake will surely bring on. Planning ahead is key, so stash some packaged oatmeal in your desk drawer (one that’s low or devoid of added sugar and artificial ingredients, of course). It can be made easily and quickly in the office kitchen, with either milk or water depending on your preference. This way, even if you forget breakfast, you’ll be set once you get to work. Caffeine plays a huge role in alertness—and most of us can attest to fact that our morning cup of coffee helps start the day off on the right foot. 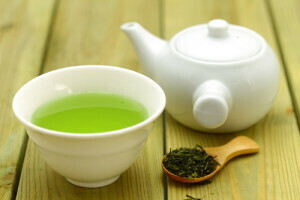 However, if you’re lagging later on, before going for another cup of coffee, consider green tea instead. While it does still contain caffeine, green tea also contains theanine, an amino acid that may improve mental alertness and ability to focus. In addition, green tea can be enjoyed with no additions, and if you typically add sugar and milk to your coffee, you might actually experience a sugar crash later on, defeating the purpose of the caffeine boost. Unsure where to start? There are tons of options, but if you’re interested in being eco-friendly as well as health-conscious, try out Numi Organic Tea—not only are their teas organic, the company is also a B corporation, and produces certified fair trade products. 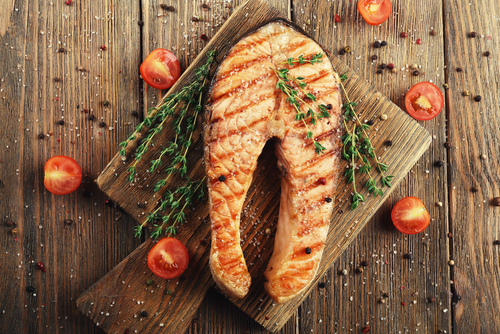 Fatty fish is often lauded as “brain food”—and for good reason. Fish like salmon, which is rich in omega-3 fatty acids, is great for brain health. In addition, diets higher in omega-3s have been linked to slower mental decline and enhanced memory. Consider bringing pre-cooked salmon as a filling, healthy lunch, maybe on a salad or in the form of lox or smoked salmon. This way, not only will you be taking advantage of the potential health benefits of salmon, you’ll already have lunch prepared and waiting for you when you get hungry, which will help you avoid making less than healthy choices (like that burger joint downstairs—no, really, at Palo Alto Software, we’re located right above an insanely tempting burger restaurant). Remember that lunchtime salad I mentioned? Here is another great addition: spinach or other leafy green vegetables, like kale or collard greens. Why not just regular lettuce? 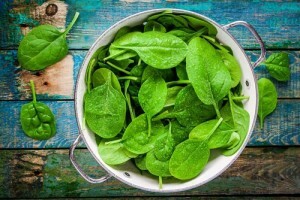 Dark, leafy greens like spinach and kale more nutritious, and contain lots of fiber, as well as vitamins and minerals. 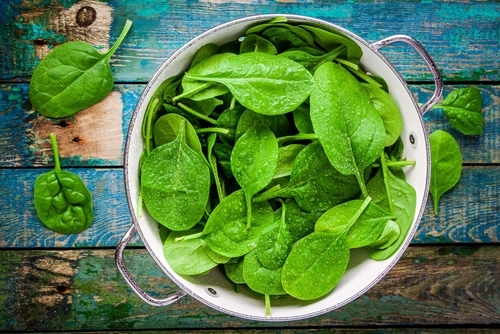 Spinach in particular is full of lutein, folate, and beta-carotene, nutrients that have been linked with dementia prevention. Nuts are high in protein, fat, and fiber, making them satisfying and filling, and dried fruits are full of fiber and carbohydrates, making them energy boosting. The combination makes a great snack, as it contains a nice balance of protein, carbohydrates, and fats. However, before reaching for the prepackaged trail mix, check out the ingredient list. Dried fruit on its own is plenty healthy—but many dried fruits commonly sold in stores have added sweeteners and sufites that should be avoided. Not only that, but dried fruit and nuts are calorically dense, meaning that a small snack can end up the caloric equivalent of a full meal. 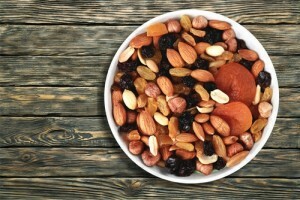 So, exercise portion control, and opt for making your own healthy trail mix. I was just as surprised as anyone when I saw popcorn popping up on lists of healthy snacks—popcorn, really, all drenched in pretend butter and ready for an afternoon matinee? Well, kind of—but leave off the butter substitute. 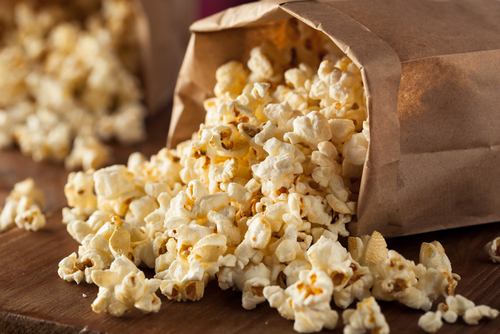 Air popped popcorn is actually full of fiber and minerals, and is a healthy whole grain like oatmeal or brown rice. Stick to the air popped variety, avoid the artificial add-ons, and popcorn is a great snack for when you’re craving something salty and crunchy, but want to keep it healthy, filling, and lower calorie (and maybe make it at home in advance if you’re worried about making the office smell like your local cinema). 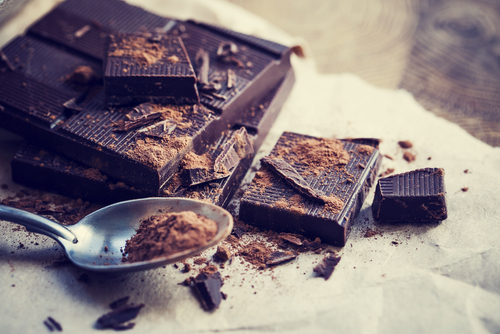 Aside from being a delicious afternoon snack, dark chocolate has plenty of health benefits, including boosting your mood, enhancing concentration, and potentially reducing chronic fatigue. The important thing to remember, however, is that when it comes to chocolate and health, the darker, the better. The more nonfat cocoa solids the chocolate has, the healthier it is—so stick to the the darkest chocolate you personally find enjoyable. Want more suggestions—including some great, office-friendly recipes? Check out Whole Living’s Best Snacks to Take to Work, as well as Eating Well’s Healthy Snacks to Stash In Your Desk for more inspiration. Plan ahead. You’re more likely to reach for healthy, brain-boosting snacks at work if you have them readily accessible, so make sure your office or desk is well-stocked. Stash snacks like trail mix, chocolate, and oatmeal in your desk drawer, and prepare lunches like salads with salmon and dark leafy greens the night before, so you can bring them to work easily the next day. Keep the office well-stocked. If you’re the office manager or person in charge at your company, maybe consider keeping some of the above foods stocked in the office kitchen for your employees. Keeping green tea on hand in addition to coffee is easy, as is offering a few healthy breakroom snacks. Make eating healthy in the office a group activity. Into the Gloss tried this out; tired of constantly reaching for candy as an afternoon pick-me-up, they ventured to Whole Foods and found healthier office snacking alternatives that the whole office could enjoy. Check out their recommendations, and consider making healthy office snacking a fun group activity—maybe invite each employee to suggest their favorite healthy office snack? So, are these suggestions “superfoods”? What’s the deal with superfoods, anyway? Ah, superfoods. The buzzword of all buzzwords. The power of so-called “superfoods” has been well-canvassed by the popular press, including claims that certain foods can reduce the risk for certain diseases and generally increase overall health. But does the scientific community back these claims? When I set out to find out what kinds of foods were best for snacking on while working, I wanted to make sure that there was solid evidence supporting the efficacy of these foods. So, let’s look at superfoods for a minute: Superfoods is a blanket term used to describe any food, typically a raw, minimally processed one such as blueberries or dark chocolate, that contains health-promoting and disease fighting antioxidants. However, the evidence is spotty at best; while there has been lab testing on certain foods, the testing generally involves compounds or chemicals that exist in the food, rather than the food as a whole. For example, while there are claims that eating garlic can reduce cholesterol and blood pressure, you would need to eat 28 cloves of garlic a day to reach the dosage of the nutrient tested in lab settings—which many would argue is unfeasable. In addition, while antioxidants are often lauded as little miracles, protecting us from a myriad of illnesses and environmental hazards, it has been found that there is little evidence that antioxidants actually minimize the impact of free radicals in lab settings. What does this mean for us? Well, the European Union has banned to use of the term “superfoods” on packaging, primarily because it is deceptive and potentially misleading. However, while the evidence that certain foods in and of themselves can have a huge impact on our overall health is spotty, it doesn’t mean we should eschew those foods from our diet—quite the contrary. It just means we take the idea of “superfoods” with the proverbial grain of salt. Do you think these “superfoods” help you stay more focused or more alert while working? How do you encourage employees or coworkers to snack healthy while at work? Share your opinion in the comments!